What do you think about the long-time-no-see gradient? It's a bit unusual nail manicure for me those days. As you can see, the polish is by ALLOYA, a Taiwanese water-based nail brand, which is new to me. I won their Facebook contest last month and the prize is one nail polish color by my choice. I am curious and asked them to send me this sky blue. From what I knew, that this brand is launched by a young entrepreneur, and is exclusively on-line for now. I used Floral Skirt for the base and sponged this sky blue for gradient (seems like this brand doesn't give their polish names). Tapped a bit Superstar to give the silver effect. 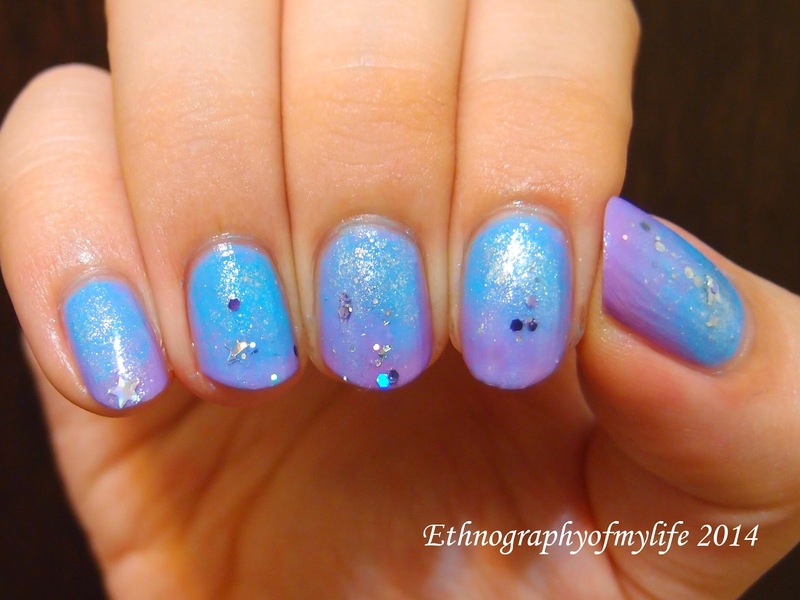 Finally, I put some Lavender Farm glitters on top to finish the look. Sadly, ends up that I don't really like ALLOYA nail polishes. They are thicker, and harder to remove compared to E-N@il polishes. Also, it has a strange scent, which is funny to me. Nevertheless, they are water-based which is compatible with my E-n@il varnishes. It won't hurt to have an additional polish in the collection. What do you think?